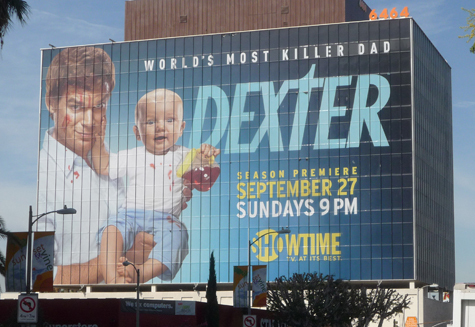 The owner of the historic Hollywood Roosevelt hotel and a Las Vegas sign company have given up a legal battle for the right to display 6-story supergraphic ads to throngs of tourists and others on one of the busiest stretches of Hollywood Blvd. Michael McNeilly, the self-proclaimed Beverly Hills artist who first gained noteriety by painting a large patriotic mural on the side of a Westwood office building and then converting it to a commercial advertisement was hit yesterday with a lawsuit seeking millions in damages for that sign and other supergraphic signs put up without permits on buildings in a wide area of Los Angeles. The lawsuit filed by City Attorney Carmen Trutanich also names 21 property owners who allegedly allowed McNeilly to put up illegal signs, including a prominent developer who has received city loans and subsidies. 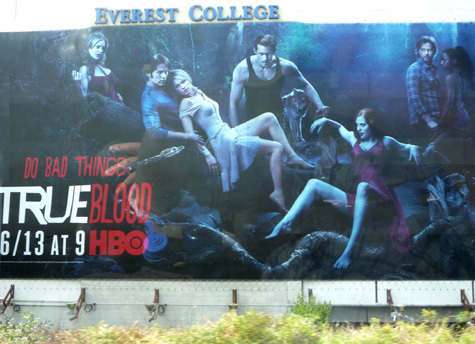 World Wide Rush Ruling: Game Over For Rogue Sign Companies? Does yesterday’s decision by the 9th Circuit Court of Appeals upholding the city’s right to ban off-site, supergraphic, and freeway-facing advertising signs mean that impresarios of blight like Barry Rush of World Wide Rush and Michael McNeilly of Skytag, Inc. will be packing up their multi-story building wraps and heading out of town? To shed some light on that question, and other issues relevant to yesterday’s eagerly-awaited court ruling, we conducted the following Q&A with ourselves. Supergraphic sign alongside 10 freeway in West L.A. City alleges tree removed from right-of-way for sign visibility. Two weeks after the City Attorney’s office filed a lawsuit charging Vanguard Outdoor Advertising with putting up illegal supergraphic signs on five L.A. buildings, a brand new supergraphic has gone up on one of those buildings, just west of the Robertson Blvd exit from the 10 freeway. 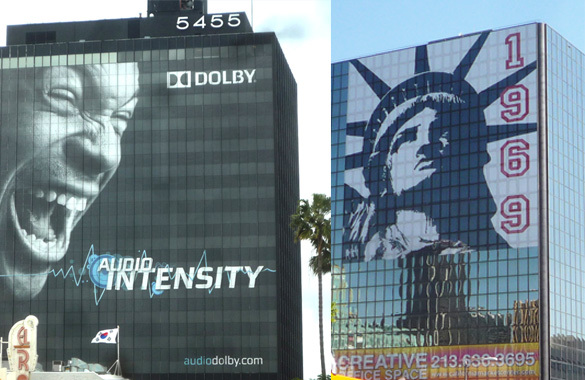 A Hollywood property owner sued last week by the L.A. City Attorney for allowing illegal supergraphics on two Sunset Blvd. office buildings declared in a federal court filing two years ago that city officials were willing to allow the signs in exchange for fees and other considerations worth more than two million dollars. 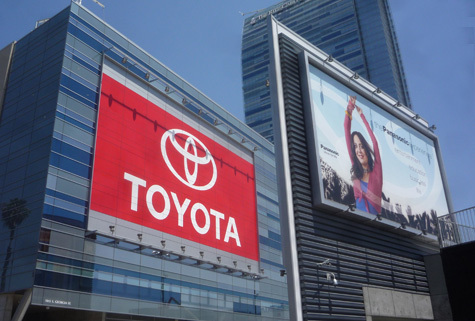 Toyota supergraphic on ballroom of Ritz-Carlton and JW Marriot Hotel. The sign at right is on the hotel parking structure. 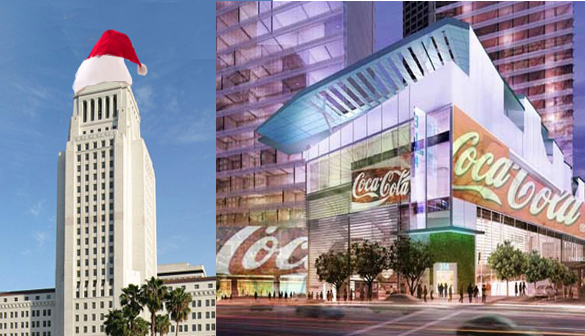 Our friends at Curbed LA have posted a photo of a large Coca-Cola supergraphic being installed on the west side of the brand new Ritz-Carlton and JW Marriott Hotel in the L.A. Live area downtown. 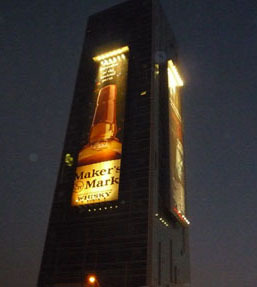 From the tenor of comments to that post, it seems most people think such advertising is crass and tacky, especially given the geographic and architectural prominence of the building. During his 2009 election campaign, City Attorney Carmen Trutanich promised to crack down on anyone putting up illegal billboards and supergraphic signs. 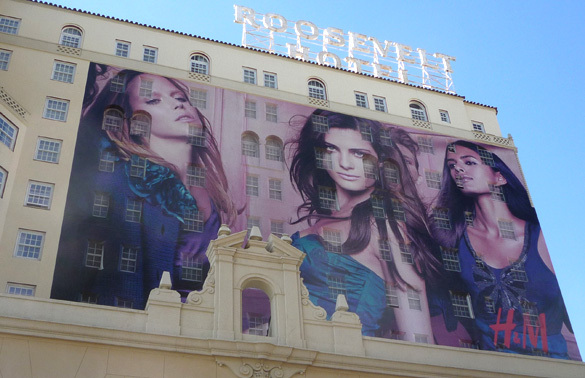 Continuing to make good on that promise, his office has gotten the owners of the Hollywood Roosevelt Hotel to remove the latest in a series of illegal supergraphics that have covered the walls of the historic structure for the past four years.